This is my first entry to Home Bakers Challenge. One of this month's challenge is Biscuit Sablés. The French word sable means sand, also this was created for the first time in a town called Sablé sur Sarthe few years ago, because of the texture and the origin these biscuits are named as Sablé, however these biscuits are seriously very soft, delicate, buttery with a fantastic texture. Its true that it makes a wonderful pair with a cup of tea or coffee. Powder sugar, sieve it and keep it aside. Beat Butter (at room temperature) until fluffy. Add Sugar and beat again so that sugar gets combined well with the butter and till the mixture turns fluffy. Sieve All Purpose flour and Vanilla Powder. Add this little by little to the mixture until it gets combined well. Now add milk and knead to form a stiff dough. Using two non greased baking sheets and with the mixture in between roll out the dough. Using the cookie cutter, cut it into desired shapes. Bake at 180 deg C for 15 minutes. Cool it completely in a wire rack before storing it in air tight containers or before serving. Notes: I halved the recipe. check out here for the original recipe. I use an eletric oven and baked in the middle rack. Linking this also to Love 2 bake happening at spicy treats. 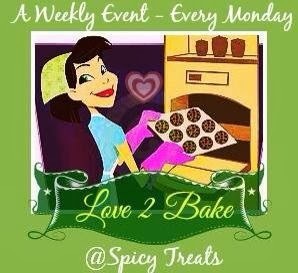 We share baked goodies every monday. i know how this tastes... so crunchy!! So crisp and perfect shortbread cookies...lovely! Lovely presentation biscuits looks crisp and delicious. we too loved this buttery cookies, u have baked it perfectly...very neat and nice presentation...thanks Laxmi for sending it to Love2bake event! Very delicious and tempting cookies.. looks perfect! !